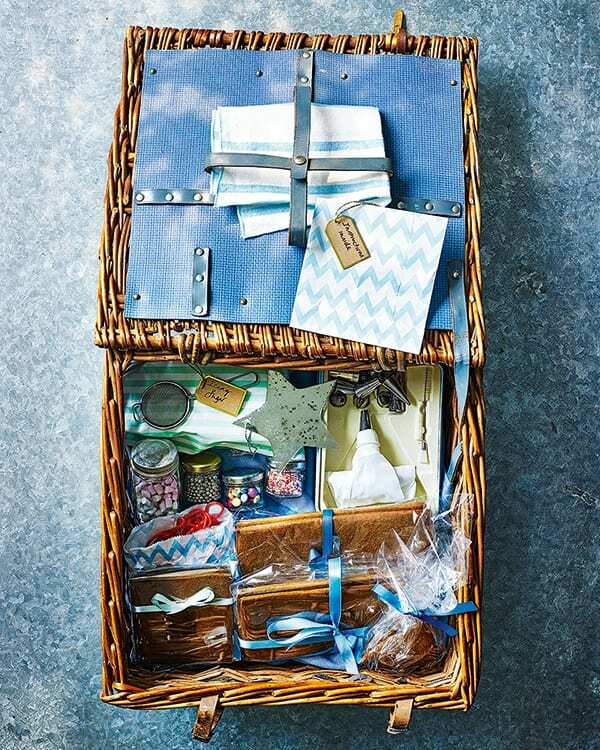 Use our gingerbread house kit to make your own festive creation or package everything up in a hamper and give it as a gift this Christmas. Put the syrup, sugar, butter, zest and ground spices in a large saucepan and heat gently until they all melt together. Turn off the heat and beat in the bicarbonate of soda. The mixture will bubble up a little. Leave for 10 minutes, then pour into a large mixing bowl. Sift the flour and salt into a separate bowl, then add to the spiced butter/sugar mixture. Stir with a wooden spoon until just combined. Don’t overwork the dough or it will spread too much when baked. Scrape the dough onto a lightly floured work surface, then gently knead until smooth. Wrap in cling film and chill for 1 hour (see Make Ahead). Roll out the dough on a lightly floured surface to about 0.5cm thickness, then use a small sharp knife to cut around the templates to make the shapes for the house (two roof pieces, two long pieces for the front and back and two ends – see You’ll Also Need). Keep the door-shaped piece of dough that you cut out from one of the long pieces and bake with the other pieces. You’ll need to re-roll the dough in order to cut out all 6 big pieces. Transfer the gingerbread to the baking sheets and chill for 20 minutes in the freezer (or in the fridge until firm). Heat the oven to 200°C/180°C fan/gas 6. When the gingerbread has chilled, finely chop the Glacier Fruits, mix the colours together and sprinkle about half a sweet’s worth into each window – they melt to make the glass. You can also cut out a window in the door and add some sweets to that. Bake for 10-15 minutes. The big pieces will need longer in the oven than the small ones, so keep a watchful eye from 10 minutes (the door might take a minute less than the other smaller pieces). When cooked, cool on a wire rack. Wrap the biscuits. To package up the gingerbread house as a gift and/or assemble it yourself, see below. First make the icing ‘glue’. Put the egg whites in a mixing bowl and slowly stir in the icing sugar until very stiff. Add the lemon juice and, using an electric hand mixer, beat the mix for about 6-8 minutes until thick, aerated and smooth. It needs to be a pipeable consistency, so you may need to add a little more lemon juice. Scrape the icing into the piping bag. a cake board/clean chopping board. Pipe the icing generously along the edges of the pieces you’re sticking together, then hold them in position for 3-4 minutes until they stick. Start with one side piece and one front or back piece of gingerbread, then add the other side piece and finally the remaining front/back of the house. Pipe icing inside the house along all the seams to make the structure extra sturdy (you won’t be able to see these lines, so don’t worry about being neat). Next stick the roof on. Be generous with the icing and be patient, as this is the hardest bit to set firm. When the roof has stuck firm (about 20 minutes) attach the door. Next, pipe icing onto the roof in a pattern to resemble tiles. Pipe icing along roof edges to look like icicles. You could change your writing nozzle to a flat star-shaped nozzle, if you have one, to pipe a simple loop along the seams. 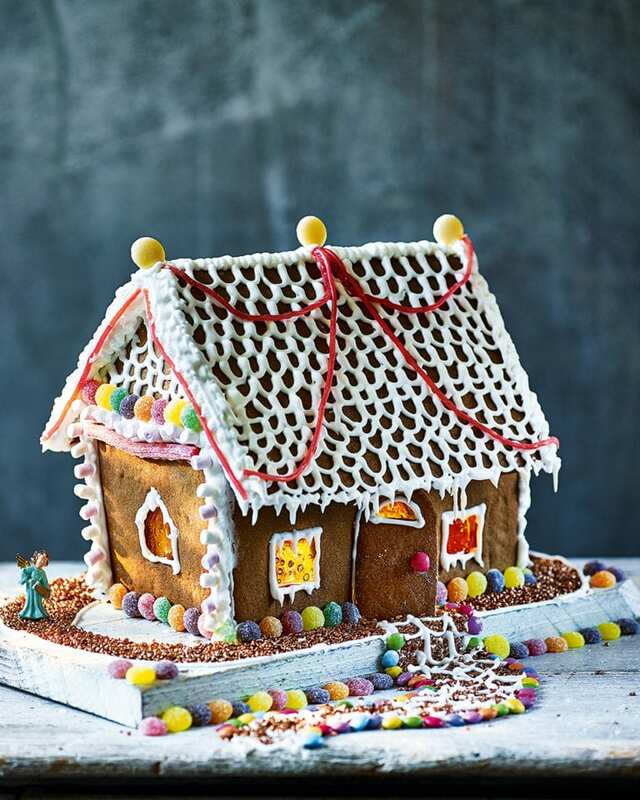 Use the remaining icing to stick on sweets and decorations to create a Hansel and Gretel-style cottage. When you’re happy with your design, leave to dry for at least 12 hours. We used old-fashioned sweet bags to pack up the decorations and wrapped the gingerbread in cellophane tied with ribbon, then put them all in a hamper to give away as a gift. Also add a piping bag with a small writing nozzle and (if you like) a flat star-shaped nozzle, plus little jars of icing sugar to make the glue to stick the house together. Write the instructions (above) on a card – or photocopy them and stick to a card – and put in the hamper. The dough is best baked after an hour of chilling but you can make and chill it up to 24 hours ahead. Grate the dough and knead it together to bring it back to a workable texture. The baked gingerbread biscuits will keep for 10 days in an airtight container.